I recently stumbled upon I Heart Cooking Clubs. I love the idea of getting to know one author/chef really well during a six-month period. I just wish I had found the group earlier, when they were focusing on Mark Bittman or Nigella Lawson. Right now, their focus is Giada De Laurentiis. Given this fact, I'm thinking I'll participate every now and then, but I just can't commit to six months of Giada. That said, when I saw that this week was "Potluck," I figured I would play along. I pulled out my cookbook specifically looking for a soup. Why a soup? Well, I spent last Friday through about Wednesday with the worst cold I've had in about two years. I know I'm lucky to have gone that long without it. I had a remarkably healthy pregnancy, and my immune system seemed to be in tip-top shape for the first ten months of my son's life. So, I was pretty frustrated when I got sick, as unused to the situation as I had become. It certainly didn't help that I was sick and running on Advil Cold & Sinus for my brother-in-law's wedding. 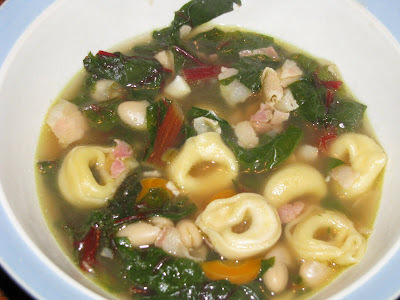 Anyway, all that aside, I chose the Italian White Bean, Pancetta, and Tortellini Soup. I find it kind of interesting that Swiss chard is not mentioned in the name of the recipe. The greens definitely featured prominently in the end result. This was my first time using pancetta. It did not disappoint. The pancetta infused the whole soup with a rich, meaty undertone. Without it, I think the soup would have been lackluster, like so many of the other "beans and greens" soups I have made over the years. As much as I hate to admit it, I need some highly flavored meat (bacon, pancetta, chorizo) to make my greens palatable. The soup turned out more than "palatable." It was filling, warming, and deeply nourishing in a "good for the soul" kind of way. I wish I had had this recipe on hand when I was a CSA member toting home huge bunches of chard and kale and collards every week. Now at least I know a good way to get in my greens. In a large soup pot, heat the olive oil over medium-high heat. Add the pancetta, shallots, carrot, and garlic and cook until the pancetta is crisp, about 5 minutes. Add the beans, Swiss chard, and broth. Bring the soup to a boil over medium-high heat, then reduce the heat to a simmer. Add the tortellini and cook 8 minutes, until just tender. Season with pepper and serve. This soup has some of my very favorite ingredients - pasta, beans and greens! Definitely looks like a sure way to feel better quickly. I agree with you that the thought of six months with Giada could seem, perhaps, a little daunting. As Heather says, maybe she will grow on us. Your soup looks very hearty and satisfying. I just happen to have some pancetta in the fridge so I may have to try it very soon. I looked at this recipe too...love tortellini! I love everything in this soup, so I've bookmarked this one to definitely try in the future. I think you are right about the pancetta.